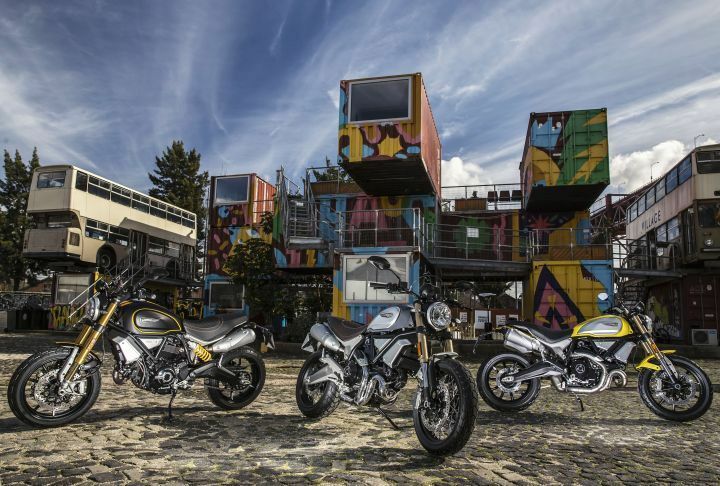 After unveiling it at the 2017 EICMA Motor Show, Ducati has now launched the Scrambler 1100 in the Indian market. The flagship Scrambler is available in three variants internationally: Standard, Sport and Special. Ducati has brought all the variants here, the Standard is priced at Rs 10.91 lakh, the Special at Rs 11.12 lakh and the Sport has received a price tag of Rs 11.42 lakh (all prices, ex-showroom India). Just as they did with the old one, Ducati has retained the 80’s influence with the new Scrambler as well. The motorcycle is still unmistakably Scrambler -- and with its round headlamps, petite fuel tank and retro single-piece saddle, it resembles the smaller Scrambler 800 in many ways. The only bit that distinguishes it are the split exhaust system, placed on either side of the saddle. Adding a dash of modernity are the all-LED lights, a twin-pod digital console and a whole bunch of electronic wizardry: five-level traction control, three riding modes (Active, Touring and City) and cornering ABS. All this comes standard on all three variants. Justifying its higher price tag, the Sports variant gets a couple of nifty additions for more performance-hungry buyers. This includes the high-performance Ohlins suspension on both ends, aluminium wheels with machined spokes and tapered handlebars. Not to mention the slick Viper Black colour scheme, with not-so-subtle yellow tank sides and dual yellow striping down the middle of the tank and mudguards. On the other hand, the Special gets blacked-out spoked wheels, chrome exhausts, and aluminum front/rear mudguards. Targetted at more hip-audience, it also gets a unique Custom Grey color as well as brushed-effect swingarm and adjustable front fork with gold-colored anodized sleeves. Powering all the variants is the same updated version of the oil-cooled 1079cc L-Twin engine from the Monster 1100 EVO. It delivers 86PS of power at 7500rpm and 88.4Nm of torque at 4750rpm. To accommodate the bigger engine, the Scrambler 100 now gets a new twin-spar steel trellis frame with aluminium subframe completing the rear. While the Standard and Special variant has to settle for 45mm Kayaba USD forks at the front and a monoshock at the rear, the Sports variant gets more premium Ohlins suspension on both ends. Braking is handled by twin Brembo 320mm discs up front and a 245mm disc at the rear.